3-D cinema has been with us for as long as the film medium itself, going all the way back to the first patents in the 1890s. And when you consider the ingenuity of such early pioneers as the Lumiere brothers, Georges Méliès, Skladanowsky brothers, G.A. Smith, Edwin S. Porter, William E. Waddell, and Thomas Edison, that’s not surprising. Various rigs and processes were devised in those early years to capture stereoscopic imagery and present it to a theatrical audience, with the first known exhibition of 3-D material occurring in 1915. But it remained something of a curiosity for decades, until the advent of television in the 1950s forced Hollywood to consider new and ever greater measures to keep audiences in theaters, including Technicolor, CinemaScope, and yes… 3-D.
Fortunately, some of those early tests and curiosities have survived in archives, attics, and warehouses the world over… and few people have been more heroic in finding, restoring, preserving, and sharing these gems with modern audiences than Bob Furmanek and his team at the 3-D Film Archive. A couple of years ago, they released a collection of some of the best 3-D films they’ve found and saved on Blu-ray 3D, under the most honest of titles… 3-D Rarities. And the disc is nothing less than a gem, a hoot, and an absolutely wonder – a genuine time capsule of the 3-D cinema, starting with simple tests created as far back as 1922, extending all the way to some of the great 3-D film trailers of the 1950s and even a short film from 1960. Included on this disc is animated and stop-motion material, narrative short films, advertising, World’s Fair demonstrations, and more. The funny thing is, you look at that list and your eye might be drawn to one item or another. But most of it will be meaningless until you actually experience it. Case in point: the New Dimensions short, from the Chrysler exhibit at the 1940 World’s Fair. The title simply can’t prepare you for the experience of watching a Plymouth Sedan assembling itself in stop-motion and 3-D set to hammy music. Really, the most lovely thing about this Blu-ray 3D is just the sheer fun of putting it in and pressing play. You’ll be surprised at almost every turn. You’ll find yourself laughing at times, marveling at others. Only the most jaded viewers wouldn’t be charmed by the end of it all. Note that most of the material is full frame, but a few of the later offerings are widescreen. The image quality obviously depends on the vintage and condition of the film elements, but mostly it’s quite good and the original 3-D effect of each has been well preserved for Blu-ray 3D viewing. There’s also a lovely liner notes booklet to accompany this material in the package, featuring text introductions by film historian Leonard Maltin and Trustin Howard (aka Slick Slavin) and essays on individual segments by Julian Antos, Hillary Hess, Thad Komorowski, Donald McWilliams, Ted Okuda, Mary Ann Sell, and Jack Theakston. Given the nature of the package, it almost feels like an embarrassment of riches. I certainly came late to the party here, but I’m eternally grateful to Bob Furmanek for his persistence in getting me to experience this release. It’s a true delight. 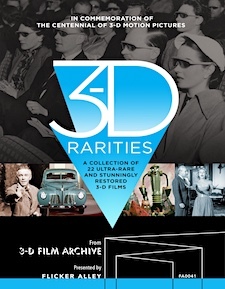 If you’re a serious fan of cinema (as we certainly are here at The Digital Bits, especially of cinema history and the legacy of those early film pioneers) – and if you have Blu-ray 3D viewing capability – Flicker Alley’s 3-D Rarities is not to be missed.